Abstract: Environmental forces are discussed in connection with the overall problem of the design of new, or the assessment of existing, structures. It is essential to see environmental forces in this broader context and to integrate them with all the other aspects involved. ‘Structures’ refers here in general to all types and applications – floating and bottom supported, compliant and fixed. Where a discussion is aimed at a particular group, this is specifically identified, such as in the case of fixed space frame structures, to which special attention is paid. Offshore structures engineering has, in many respects, become a mature discipline. However, further developments are still necessary to fully benefit from the large increase in knowledge after so many years of research and development efforts, as well as from the accumulated experience with real platforms offshore. This is in the best interest of safety, the extended use of existing structures and the more economical design of new ones. The next major step is sometimes suggested to be structural reliability analysis, which would require both the loading and the structural models (describing generally elastic as well as rigid body properties) to become probabilistic. In general, this is not yet considered to be within reach and is cautioned against. However, the underlying principle is warmly supported and the introduction of concepts which are firmly based on reliability analysis methods is a realistic goal to aim for. It is suggested that significant progress in this direction can be made by using loading models which incorporate the probabilistic features which reflect the random wave environment in a realistic manner, in combination with (nearly) deterministic structural models. Where such loading models are not already current practice, they should be introduced forthwith. This demands a truthful representation of random wave kinematics and realistic force coefficients, including the drag and inertia coefficients in Morison’s equation for fixed structures. A perceived way forward is described and proposals are made on how to achieve this. Abstract: The deployment and operation of a high resolution (1km) HF radar (OSCR) for the measurement of surface currents in Poole Bay, UK is described. In addition, two pairs of Interocean S4 current meters (located 1m above the seabed and at mid–depth), plus a single S4 current meter (1m above the seabed) were deployed to provide information on the sub–surface flow. Example OSCR data are presented to indicate the overall current regime in the area. The data have been analysed to provide tidal and residual components of the observed current, information on the effect of wind stress on the surface waters and vertical variation in current speed and direction through the water column. The results indicate the presence of predictable current shear with depth, that allows the surface tidal component to be extended to mid– and near–bed depths. 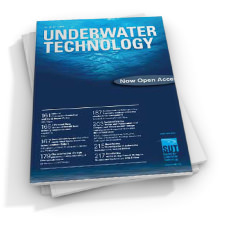 Abstract: If a nitrox mixture with an oxygen content greater than 21% is breathed instead of air during a dive, then it is possible to extend bottom times for a given decompression time or to reduce the amount of decompression time for a given bottom time. 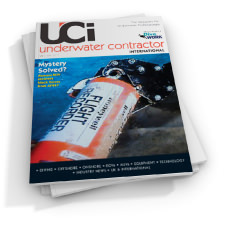 In addition, the level of nitrogen narcosis suffered by a diver may be significantly reduced on deep dives. A simple nitrox mixture is made by adding pure compressed oxygen to compressed air, known as oxygen–enriched air. The use of such mixtures is increasing in the recreational diving public in Florida, USA, where it is available at many air filling stations. However, there are new dive limits on these mixtures which are posed by the higher exposure to oxygen and the fact that there are no special–purpose decompression tables available. The nitrogen–equivalent air depth N2/EAD) is normally used to convert standard air tables, but this method may not be correct for dives other than simple no–stop air dives. The oxygen limits are discussed and the equivalent air no–stop table on 68%–32% nitrox is given for both USN Standard Air Tables and the BSAC’88 Tables. Abstract: One of the most innovative oilfield construction projects undertaken in recent years was the installation of a barrier wall around a North Sea platform. Before the two semi–circular concrete walls could be installed, in water of more than 70m deep, the seabed around the platform required considerable preparation. This work included the removal of scour–protection material from the periphery of the platform, debris removal from the seabed and sub–surface, and levelling an area more than 200m in diameter to an accuracy of ± 15cm, in order to generate a horizontal seabed foundation. Most of this work was undertaken using a remotely operated construction vehicle, fitted with a number of specialised tools (Fig 1). This paper describes the vehicle and its tooling, control systems and techniques which were developed for this project, and reports on the actual performance of the system on site. Abstract: The civil engineering construction of Britain’s first demonstration prototype wave power device, located on the Isle of Islay off the west coast of Scotland, was completed during November 1988. The turbine generator was installed during December 1990. After initial testing the station will supply power to the main electrical grid system. During the preceding year the pneumatic power output was monitored. Although there is considerable scope for improving the system, the initial results are very encouraging and the prototype should be capable of producing electricity for about 6 to 7 pence per kilowatt hour. Initial design studies, based on the experience gained from the Islay project, indicate that larger systems could produce electricity at half this price during the capital payback period of 25 years, reducing to 2 pence per kilowatt hour for the remaining life of the structure. Abstract: A new offshore tool has been developed which is capable of detecting and quantifying the content of gas either in free or dissolved form. The tool is deployed in a similar fashion to other in situ tools (eg, the cone penetrometer) and is used to take samples of pore fluid (including any gas) at selected depths in the soil profile. The pore fluid samples are analysed by gas chromatography onboard the survey vessel and the gas content can be determined within 15–20 minutes. The trend of dissolved gas content with depth may be used to predict gas pockets ahead of the drill bit during soil investigation or drilling operations. Thus blowouts may be prevented. In addition, the in situ amount of gas in the soil can be determined. Laboratory samples can then be restored to the in situ gas content as well as in situ stress conditions, and tests can be run to obtain correct soil parameters. The article concludes with case histories from five soil investigations. Abstract: In 1980 the first flowline bundles were fabricated onshore and towed to the field using the controlled depth tow method (CDTM). In the past ten years the CDTM and other tow methods have become established and accepted techniques for the further development of satellite fields. A logical new development is the full integration of the production system and flowline bundle as a towed production system (TPS), which avoids separate installation of the production system. In particular, subsea hook–up and connection to the flowlines and umbilicals are no longer required. The towed production system will be fabricated and fully tested onshore, before being towed offshore, securing maximum reliability. The system offers maximum design flexibility and can be fine–tuned to suit a particular field development plan. Substantial cost savings of up to 20% can be made with TPS and it can be designed for water depths up to 2000m. The bundle can contain all types of flowlines and umbilicals, whereas the production system can contain manifolding, templates, emergency shutdown values and/or processing facilities. The production system can be at either end of the bundles or at one or more intermediate locations. This paper will review various concepts and examples ranging from simple lateral entry, integrated manifolding, and integrated manifolding combined with drilling slots, to the complex fully integrated production system. The other end of the bundle can be fully integrated with the riser bases, direct pull–in structures to can even be an onshore facility. Experience on projects applying various options of the towed production system will be highlighted, as well as further achievements in the design for deepwater applications. Abstract: Respiratory heat loss is a major problem for divers in a hyperbaric environment. A passive, regenerative heat exchanger may be used to reduce such heat loss, increasing the safety and comfort of the diver in both normal and emergency situations. 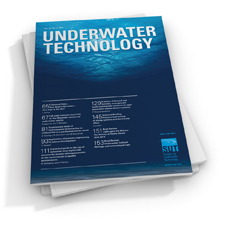 The development of sophisticated hyperbaric breathing simulators has allowed the gas temperature and flow characteristics of a diver’s respiratory system to be reproduced under simulated diving conditions with various workloads. This proves an invaluable tool for obtaining performance data on potential systems and equipment. Useful data have been obtained on the efficiency of a simple regenerator matrix, composed of stacked nylon mesh discs, under simulated operational conditions in air and heliox to 31 bar pressure. Data directly pertinent to a diving scenario, based upon physiological and other relevant constraints, are given. The role of such a regenerator as an integral part of an overall diver thermal protection system is discussed with reference to reduced diver heat loss, extended mission times and the possible benefits in terms of operating costs and logistics. Abstract: In fine–grained sediments, undissolved gas occurs in the form of discrete gas bubbles that are much larger than the normal void spaces. Results from a programme of experimental research indicate that these gas bubbles affect the geotechnical properties of the sediments, with important consequences for the performance of offshore foundations. In particular, the undrained shear strength and undrained elastic moduli can be significantly reduced by the presence of gas bubbles, resulting in a decrease in the short–term ultimate load capacity of a foundation and an increase in the immediate settlement. Real–Time Photogrammetry – A Technique for Today or Tomorrow? Abstract: Photogrammetry has been in regular use since 1980 to produce three dimensional measurements underwater for a variety of tasks. 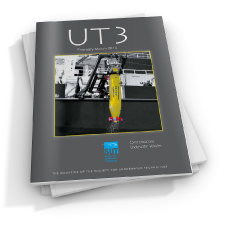 This paper will briefly summarise the history of the technique, from its inspection–orientated origins to the latest engineering–related, deepwater, ROV surveys, in order to analyse the strengths and weaknesses of the technique. This analysis will introduce the technological improvements, leading to the satisfaction of market demands, that can be made possible with advancing technology. The development of Real–Time Photogrammetry, from the feasibility study to offshore trials, will then be introduced, emphasising the enormous possibilities of the technique and its component technologies: electronic still imaging, digital image data transmission and storage, real time and still stereo viewing, and near instant three dimensional measurements of complex objects. The by–products of the development will also be introduced, which include total electronic reporting systems and the database–controlled replay of visual data within a networked computer system, with suggestions as to how these could influence structural and pipeline inspection, as well as engineering surveys in today’s, as well as tomorrow’s, world. Abstract: Against a background of increasing centralisation of standards in Europe to make ‘European Norms’ (ENs), the role of the Exploration and Production Forum in advising the American Petroleum Institute (API) on the international application of API standards will be described in this article. The evolving international significance of API standards is a factor in the issue of new or updated API specifications, which more accurately reflect the functional standards required by oil companies for their operations worldwide. API 17D – Subsea Trees and Wellheads is a good example of the results of this process. API 17D can, and should, be regarded as an adequate basis for procurement of subsea hardware, needing only a minimum of additional field–specific data to fully describe the functional requirements. Using 17D as a model, and building on a recent successful project which gathered information on the reliability of subsea umbilicals, a Joint Industry Project has commenced to prepare the basic material from which API 17E – Subsea Umbilicals will be developed. The Coastal Zone: Terra Incognita? Mare Incognitum? Abstract: The ocean is central to the climate system of the Earth. The Intergovernmental Panel on Climate Change, in their Scientific Assessment (Ref 1) described the ocean as influencing the timing and patterns of climate change. Global ocean processes mix surface waters down into the interior of the ocean, locking away the incident solar energy, and slowing the atmospheric warming. Regional patterns of climate changes will be influenced by the global scale ocean circulation. Ocean physics and ocean biology, from planktonic scale (10–5 m) to that of the global scale thermohaline circulation (108m), are therefore key elements in the Earth’s climate system. Existing observation practices and methods for the ocean are far from sufficient to provide data at the spatial and temporal resolution needed for climate monitoring and forecasting. Only through advances in technology can the data be acquired. Innovative sensors using acoustics and optics, autonomous submersibles, and in situ long term moored and drifting instruments equipped with data telemetry will be needed to monitor the ocean. Abstract: The sampling of defects from a wide range of structures is regularly carried out for metallurgical examination. However, the present system of grinding is found to be somewhat cumbersome and lacking in precision. This paper describes the successful application of electrochemical machining for removal of defects from a wide range of weld geometries. The control strategy adopted has led to the construction of equipment which not only produces machined surfaces requiring little or no preparation prior to repair, but also enables the defect or sample to be removed without damaging the parent structure. Furthermore, the forceless nature and portability of the equipment would be particularly beneficial when used in a subsea environment. Offshore soils are normally considered as a two phase material, ie, soil and water. Under certain geological and geochemical conditions, soils can be encountered which are three phase, ie, soil/water/gas. Shallow gas can be either petrogenic or biogenic and, dependent upon the degree of concentration and pressure, may govern many aspects of subsequent development activities at an offshore location. This paper describes the influence of such shallow gas on one such activity, ie, geotechnical site investigation. Abstract: The 30″ North Sea gas pipeline in the Danish sector had suffered damage to the concrete weight coating and the corrosion coating at several points on an exposed part of the pipeline. This occurred in the vicinity of a subsea valve assembly protection cover which is located approximately 1.5km from the Tyra gas platform. The damage was probably caused by trawlboards and other heavy fishing gear. In order to repair the damage, several methods of repair were considered to find one which could provide the necessary mechanical protection and the required weight, as well as giving adequate corrosion protection to the bare metal areas on the pipeline. Furthermore, the method had to be applicable with minimal pipe surface cleaning. After thorough investigations of the alternatives, the choice was made to carry out the repair using a new product called Densit®. Densit is a composite material made by mixing Portland cement with micro–silica and a superplasticiser. The ultrafine micro–silica particles fill the voids between the cement grains, thus creating an extremely dense paste. This high density gives the material a number of unique properties. It can be pumped through long lengths of hoses, and will cure under water. The paper describes the design, planning and repair work carried out on two sections covering the complete surface of 18m and 20m of the above mentioned pipeline, as well as the results of laboratory examination of the ability of the product to provide corrosion protection to bare metal areas. 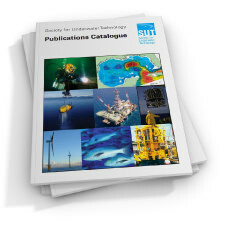 Abstract: This paper describes the Gannet development and its extensive use of subsea production facilities. It describes the consultations carried out with other seabed users, and the agreement on a protection philosophy for subsea wells using a combination of fishing exclusion zones and non–exclusion zones with ‘over–trawlable’ structures. The functional requirements and design loads used for detailed design are outlined. The paper also describes the structures and piles and how they meet the functional requirements. It covers the model testing carried out to assess ‘over–trawlability’, and the changes that were made as a result. The installation of the structures is also briefly described.